The 11th edition of the strong Dubai chess open tournament is over. The winner is the Armenian GM Tigran Kotanjian who finished with 7,0/9. With the same points finished GM Bocharov and GM Anastasian, but Kotanjian won the first place with a better tiebreak. A total of 34 GMs participated in the event, most of them within 100 ELO margin. That created a very dynamic event and many surprises were seen during the course of the competition. One of the best performances was for IM Kidambi Sundararajan (IND), who finished 6th, just half a point behind the leaders. The two top youngsters GM Gopal and GM Safarli finished 19th and 20th with 6,0/9. The Dubai chess open started back in 1999. Since then there are 11 champions, the last one being GM Tigran Kotanjian. Here is a flashback from the past events from Dubai. It is the tournament where Magnus Carlsen became a GM (6th edition), one of the first top events won by GM Wesley So, and among winners we can see Mamedyarov, Sargissian, Goloshchapov, Asrian, Jobava, Akopian. The Dubai Open celebrated its 10th anniversary in 2008 with 131 players from 25 countries in the tournament with 29 GM/WGM, 21 IM/WIM and 22 FM/WGM seeing action at the Dubai Chess Club in Dubai, United Arab Emirates. The Sheikh Rashed Bin Hamdan Al Maktoum Cup was awarded to the winner of the 9-round Swiss. The world’s youngest Grandmaster at the time, 14-year-old Wesley So of the Philippines, won the Dubai Open with 7 points out of 9 rounds. The Filipino tied with GMs Merab Gagunashvili of Georgia, Ehsan Ghaem Maghami of Iran and Li Chao of China but prevailed in the tie break of higher average opponent rating. Eight other players tied with 6.5 points each. Wesley received a congratulatory telephone call from National Chess Federation of the Philippines President Prospero Pichay. Local hero FIDE Master Salem Abdulrahman Saleh, Asian under-14 champion, clinched his first GM norm with one round to spare. Salem Abdulrahman from UAE and Zhou Weiqi from China make Grandmaster Norm and and Also Soozankar Mohamad from Iran and Wu Xibin from China made International Master Norms. 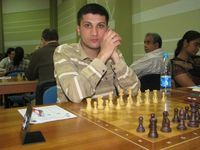 GM Levan Pantsulaia of Georgia won the Sheikh Rashid Bin Hamdan Al Maktoum Cup finishing with 7 points in the 9th Dubai Open held 22 to 30 April 2007 at the Dubai Chess Club in Dubai, United Arab Emirates. Pantsulaia won by tie break over GMs Amir Bagheri of Iran, and Gadir Guesinov and Sarhan Guliev of Azerbaijan. Sheikh Rashid Bin Hamdan Al Maktoum awarded the champion’s cup to GM Pantsulaia together with the Dubai Chess Club President Ibrahim Al Bannai. The 9th Dubai Open saw the participation of 126 players from 24 countries including: 25 Grandmasters, 4 Woman Grandmasters, 15 International Masters, 3 Woman International Masters, 18 FIDE Masters, and 7 Woman FIDE Masters. The Dubai Chess Club provided excellent facilities for the players. Under the supervision of Mr. Ahmed Toukhi of the Dubai Chess Club, the official hotel, the Vendome Plaza, gave good service to the players. Bus service between the hotel and the tournament venue was on time and coordinated well by Mr. Ahmed Barakat of the Dubai Chess Club. GM Zviad Izoria of Georgia led a strong field of 22 Grandmasters, 19 International Masters, and 40 FIDE titled players in the 8th Dubai Open Championship. GM Gabriel Sargissian, GM Tigran L Petrosian, and GM Fedorchuk tied for the champion title with 7 points. There were quick draws on all the top 5 boards that left to share the second place with 13 players. Prominent juniors like Sethuraman, Wesley So, and Eltaj Safarli made IM norms. The tournament was a grand success for the juniors who proved their talent and displayed their skills. Indian youngsters like Sethuraman and Sai Srinivas gained a lot of rating points. With record number of 60 grandmasters one expected the invited grandmasters to stamp their class and get going. The participants list included GM Kiril Georgiev, GM Alexander Motylev, GM David Navara, GM Mamedyarov, GM Ni Hua, GM Kobalia, GM Bu Xiangzhi, GM Sergey Volkov, GM Efimenko, GM Miroshnichenko, etc. To everybody’s surprise, the winner of the event did not have any international title. It was the Chinese player Wang Hao who finished clear first with 7,0/9, defeating GM	Solak, GM Riazantsev, and GM	Kacheishvili in the process, and finishing without a lost game. Second place was shared by 7 GMs. World Junior Champion 19-year-old Grandmaster Mamedyarov of Azerbaijan clinched the Dubai Cup with seven points after defeating overnight leader Grandmaster Pavel Eljanov of Ukraine in the last round. Twelve players, GMs Liviu-Dieter Nisipeanu of Romania, Viorel Iordachesvu of Moldova, Evgeny Vladimirov of Kazakhstan, Artashes Minasian of Armenia, Mohamad Al-Modiahki of Qatar, Ukrainian trio of Evgenij Miroshnichenko, Pavel Eljanov and Alexander Goloshchapov, International Masters Magnus Carlsen of Norway, Rauf Mamedov of Azerbaijan, Sasikiran and Harikrishna shared the second spot with 6.5 points each. 1990 born Norwegian kid Magnus Carlsen made his third and final Grandmaster Norm and became the 2nd youngest ever to make the Grandmaster title, just a little behind Ukraine’s wonder boy Sergei Karjakin. GM Krishnan Sasikiran of India and GM Kharlov Andrei of Russia with an International Elo Rating of 2633 were the top seeds in the Dubai Open Chess championship for the Sheikh Rashid bin Hamdan Cup with a record number for that time number of 104 participants from 30 countries. There was also a record number of 42 GMs. GM Goloshchapov (UKR) became champion after multiple surprises in the strong competition. The 3rd Dubai Open Chess Tournament was attendend by many Russian GMs: Andrei Kharlov, Valerij Filippov, Alexander Motylev, Andrey Shariyazdanov, Mihail Kobalija, Alexey Kuzmin, Evgeny Pigusov, Yuri Yakovich, Evgeny Sveshnikov, Andrew Volzhin, Alexander Galkin. 8 players shared the victory – Asrian, Ehlvest, Aleksandrov, Minasian, Motylev, Vladimirov, Kotsur, Ermenkov, with GM Karen Asrian winning with better tiebreak. These were the first steps of what was going to become a traditional tournament. It did not have the large number of participants that we see in later editions, but still there were some very strong invited players. Among them are the winner in 2000 – GM Alexander Nenashev, and the first champion of the Dubai chess open championship – GM Vladimir Akopian.